CHOPPED & CHUNKY Carefully selected and ready for your favourite recipe. Vegetables, Water, Antioxidant (Ascorbic Acid). Vegetables in varying proportions: Carrot, Potato, Peas, Swede. Instructions: 800W/900W 2½ mins /2 mins. 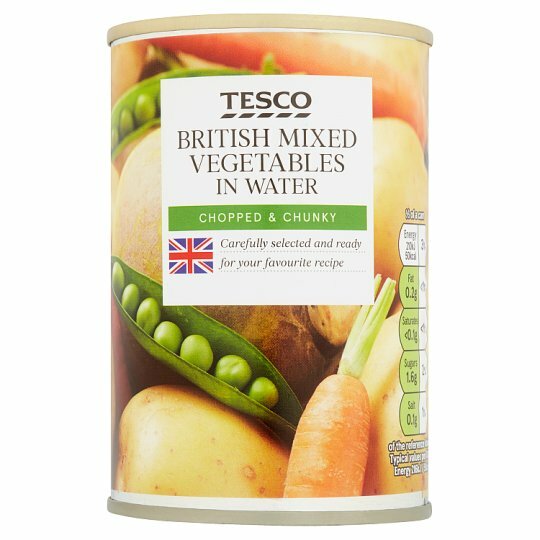 Empty the contents of the can into a non-metallic bowl ensuring water covers vegetables, and cover. Heat on full power for 1 minute 30 seconds (800W)/1 minute (900W). Stir, re-cover, then heat on full power for a further 1 minute (800W/900W). Heat gently for 3 - 4 minutes, stirring occasionally.